For the past seven years I have counted my macros. I can tell you how many grams of protein, carbs, and fat are in almost every food. I can pretty much guess 30 grams of protein with my eyes closed. I started this way of eating when I was preparing to step on stage in a bedazzled bikini. It worked like a charm and I loved the discipline and dedication it took… and ohhh how I LOVED the way my defined muscles looked and felt. Have I mentioned that bicep vein? Oh yeah… But in all reality, being in competition shape year round is not realistic or sustainable. The thing is, I have still been doing it like this and I am continually disappointed in myself when I don’t stay within the allotted macro range. I had an epiphany a few months ago… I have been working toward a goal I no longer have. Duh. I don’t plan to get back on stage, so why am I trying to eat like I am? No wonder I have been so frustrated and not attaining my non existent goal. Crazy! Talk about old habits dying hard. I‘ve been doing some research and for me what it is coming down to is the basic, old school calorie deficit method. You know, calories in, calorie out. Doing it this way has been a process for me mentally, but I feel like my world has kind of opened up. There isn’t that pressure to make sure my carbs and fats are within a certain number. (I do still track my protein). I can go to lunch/dinner with The Love of My Life and enjoy both the company AND eating the food. Sure, I still have to make wise food choices, but I have a new found freedom. It isn’t so rigid and it just feels good. I am actually excited about my nutrition again, it has become fun and kind of like a game… figuring out this new-ish way of eating. Change is a good thing. I’ve got this! I have been thinking about this question nonstop. What would I do if I wasn’t afraid? A LOT of things probably. So much of what I do, or don’t do, rather, is based on being afraid… Afraid of the what if’s… Afraid to take that leap… which in reality means I haven’t been fully living my life. If someone were to tell me that I only had 365 days left to live, would I be living the life I’m living now? Would I be satisfied with the relationships in my life? Would I be content with my decisions? Would I be happy with what I’ve done so far with the time I’ve been given? What would I do different? How would I treat myself? How would I treat others? Nothing in life is guaranteed, so it’s important to appreciate each moment and not let fear or the opinions of others limit our potential. Clearly, I need to work on this, so in lieu of New Year’s Resolutions, I have decided to have a theme for the year. 2018 is going to be my year of NO FEAR! Missed opportunities and waiting for something to happen is going to be a thing of the past, because everything I want is on the other side of fear! Bill Phillips was spot on when he made that statement several years ago. More than half of American adults today are overweight or outright obese. I get that people use food as a drug. It makes you feel good. It numbs whatever “it” is. It is a sense of control, in a crazy out of control way, if you know what I mean. I have struggled with using food to “medicate” feelings and emotions, but I ALWAYS notice a difference in how I feel, not only physically, but mentally as well, when I am eating right. 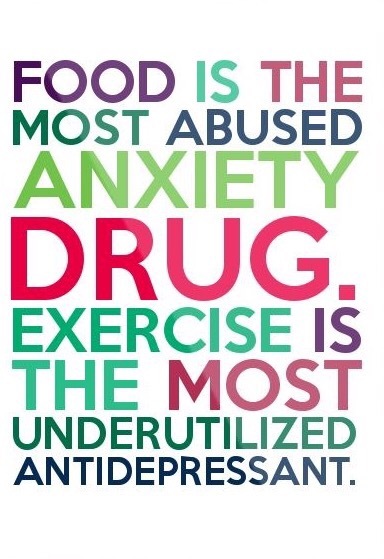 I can also relate to exercise being an antidepressant. When I went through my divorce, I made sure I exercised daily. Even though I felt like crap, I knew it was good for me. I knew mentally I needed that escape, that stress release. More importantly, my kids benefitted from it. I am pretty sure exercise was the ONLY thing that kept me sane … Ok, exercise and… Pinterest. I honestly think that if people would just take a few minutes every day and get their bodies moving, even if it is just for 15 minutes, it WILL make a difference. Make the time… just walking out the door is the hardest part. You’ve got this! Enough with the excuses. 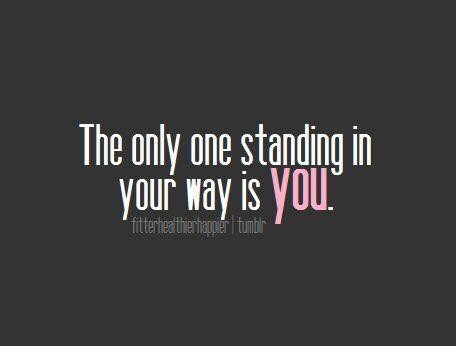 Get out of your way. What is it that is holding you back? Is is fear of failure? Is it fear of success? What happened in the past no longer matters. Today is a new day, so get back on track and move closer to your goals and dreams. Don’t let anyone tell you what you can or can’t do. YOU create the life you want.. All you have to do is believe, just DON’T stop believing! Decide what you want and go after it… Go after it with EVERYTHING you have! NEVER quit! You’ve got this! I am approached daily by friends or family asking for advice on weightloss (and nutrition… and exercise). With so much information out there, so many different diets/programs, it can seem overwhelming and rather confusing. I’ve been there! 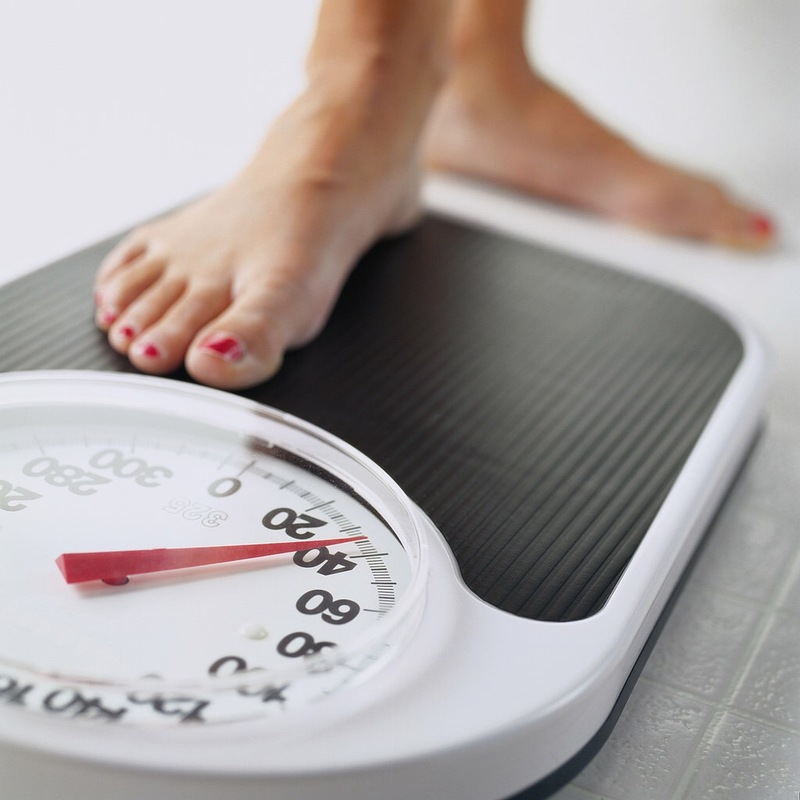 Regardless of the plan you choose, there are rules that apply to weightloss. RULES… More like guidelines… I don’t like rules! Ha! Implementing the following will definitely help you in losing weight. 1. It’s a lifestyle, NOT a diet. This isn’t a quick fix, it’s a way of life. 2. Get organized. If you fail to plan, you plan to fail. Structure your life and you’ll structure your eating. Create a healthy meal plan for the week, write a shopping list (and stick to it). Prepare meals and snacks in advance. A little planning means you avoid eating those yummy little gold fish or whatever it is your kids are snacking on. 3. Eat small. I’m talking portion control… It is vital for losing weight. Eat dinner on smaller sized plates and when eating out, split your meal with your date, or ask the server to box half of your meal before it even gets to your table. Check online menus, if available, for nutrition information ahead of time. 4. Leave food on your plate. (This one is really a continuation of #3) Leaving food on your plate can aid in taking control of compulsive eating. Many restaurants serve huge portions, sometimes enough for two or three people. Order menu items that contain fewer calories and eat a smaller portion. Bring leftovers home for another meal. 5. Never feel deprived. If you feel deprived, you will be more likely to binge. If you want a treat make it yourself and make it healthy. 6. Eat slowly. That way you will feel satisfied before you’ve eaten too much. It takes about 20 minutes for your brain to get the message from your stomach that you are no longer hungry. Fast eaters are often overeaters, while slow eaters tend to eat less and are still satisfied. 7. Drink water. 6-8 glasses a day is ideal, or about a half gallon. Hunger is often confused with thirst and dehydration, so drink before you eat. 8. Enjoy your food. It is one of life’s greatest pleasures, not a punishment. 9. Move. Exercise is essential to weight loss. Schedule it into your day, just like an appointment and treat it like one. Take advantage of incidental exercise. Take the stairs or park farther out in the parking lot. 10. Get enough sleep. Structuring your sleep patterns will help regulate your metabolism. Tired people have increased ghrelin, a hormone which stimulates appetite. 11. Focus on what motivates you.. A note, a photo, or a quote. Keep it with you or in a place where you will see it often as a constant reminder of why you want to change, AND embrace that change. You can’t expect to do the same thing over and over and miraculously get different results. Trust the process and remember, one pound at a time! You’ve got this!